To our left, the waiting area has seats with the latest trend in indoor landscaping – the asian bamboo. 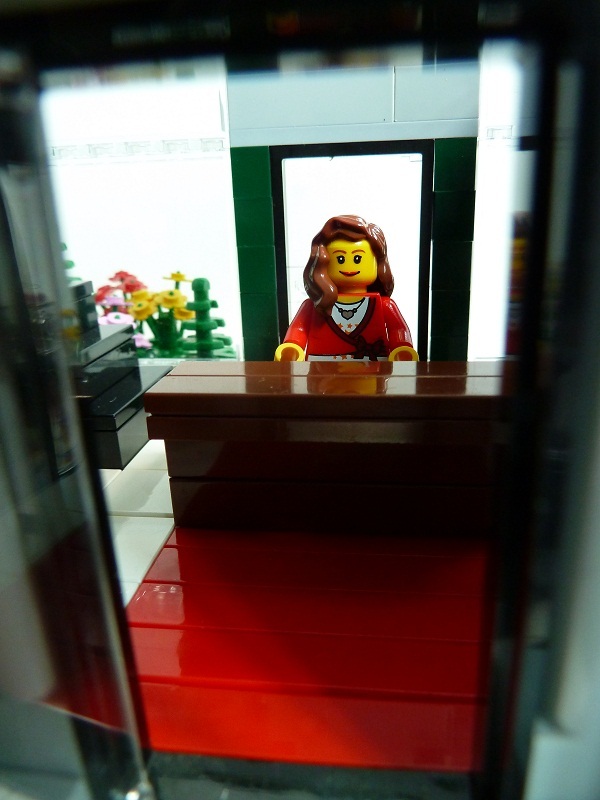 To our right, it’s the Mayor’s office – an overhead shot shows the key to the city gleaming above the Mayor’s desk. 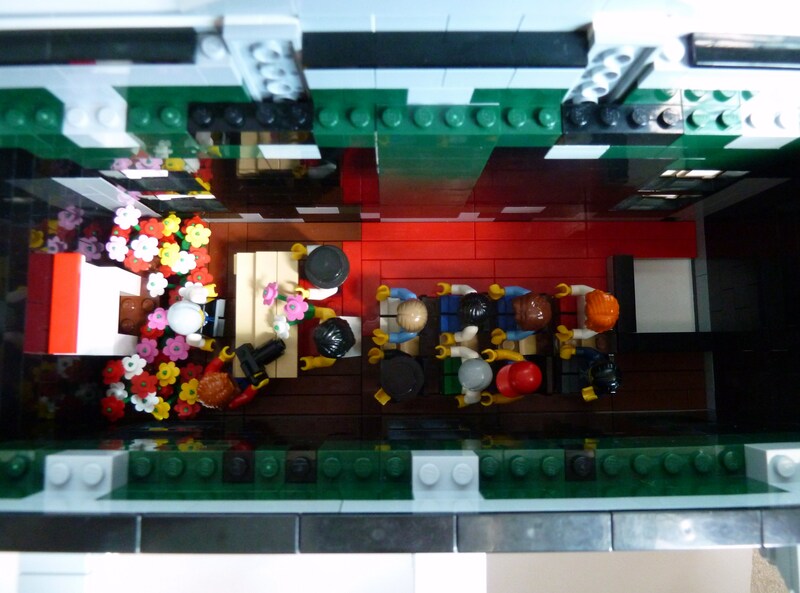 Another overhead shot shows the layout of the 1st floor. Oh shall go up the stairs and have a look at the 2nd floor? 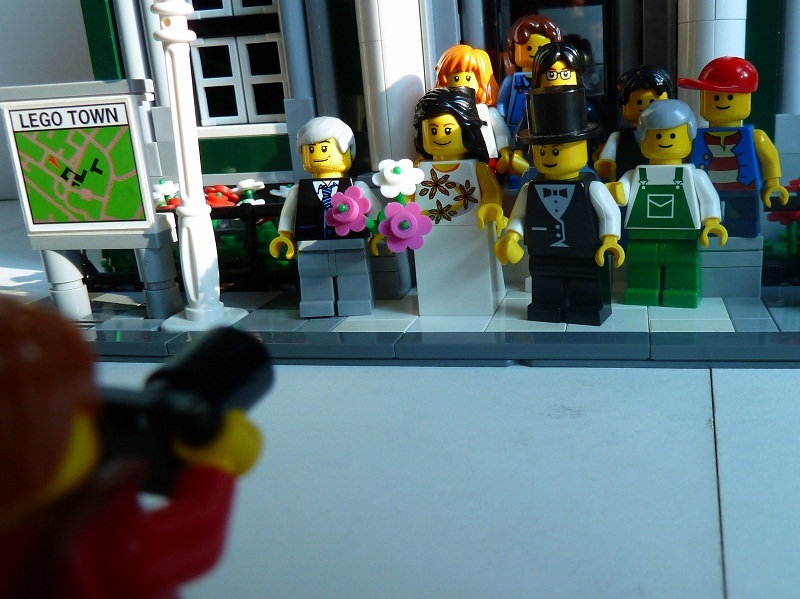 Ah, we are in luck, a Lego town wedding is in progress! And so that’s where the Mayor & Pete is, officiating the wedding and taking shots of all the special moments respectively. 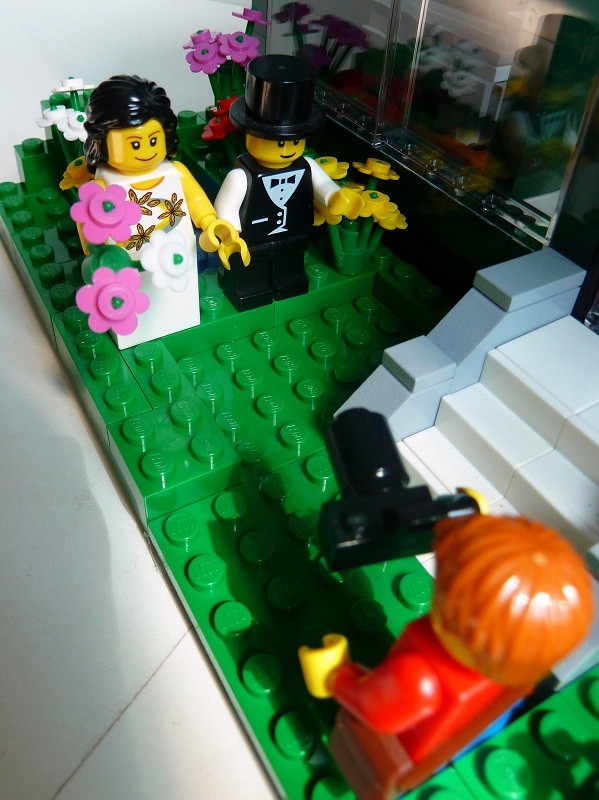 In the pic of the wedding guests we have… oh dear! 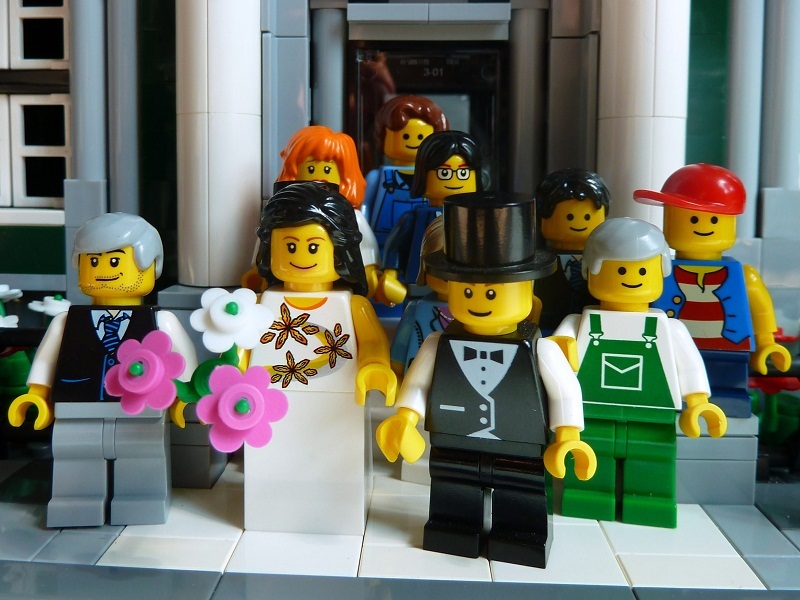 It’s the groom’s upset ex-girlfriend in the last row. Hope she’s not here to cause a scene! I know, the most important shots! Front and Back views below. 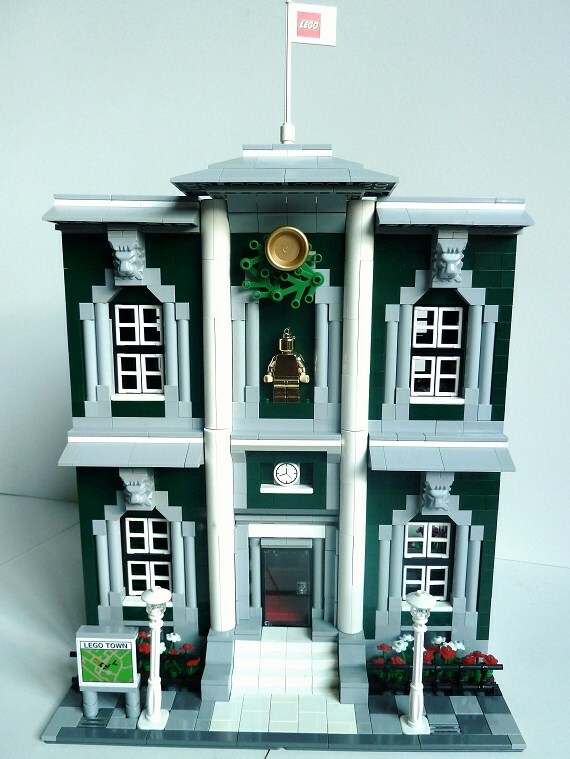 The Lego flag is flying high above the Hall and the golden statue (yanked from the Golden minifig key chain) is that of Sir Archibald Goldiness, the first mayor of this town. This modification of the town hall from the Town Plan set (10184) took 3 sets, and I still ran out of bricks. 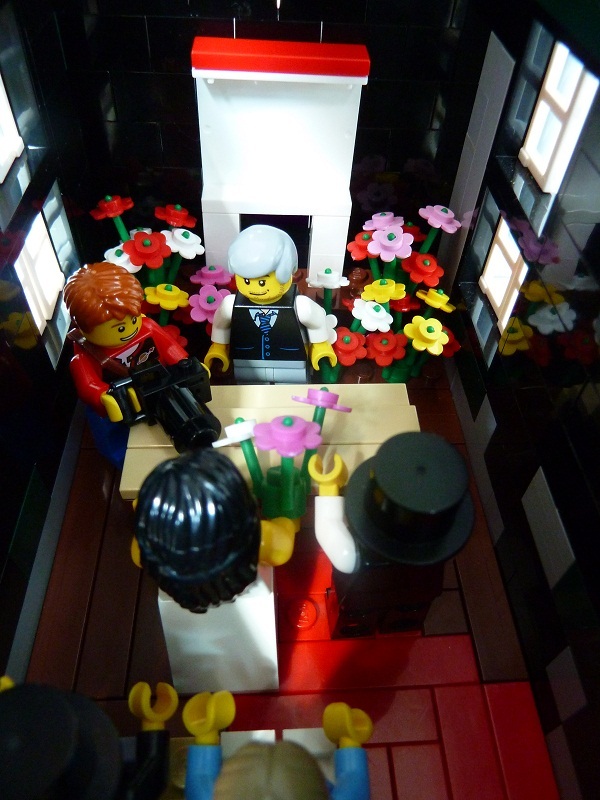 So you may have already noticed the liberal use of black bricks for inner and side walls. 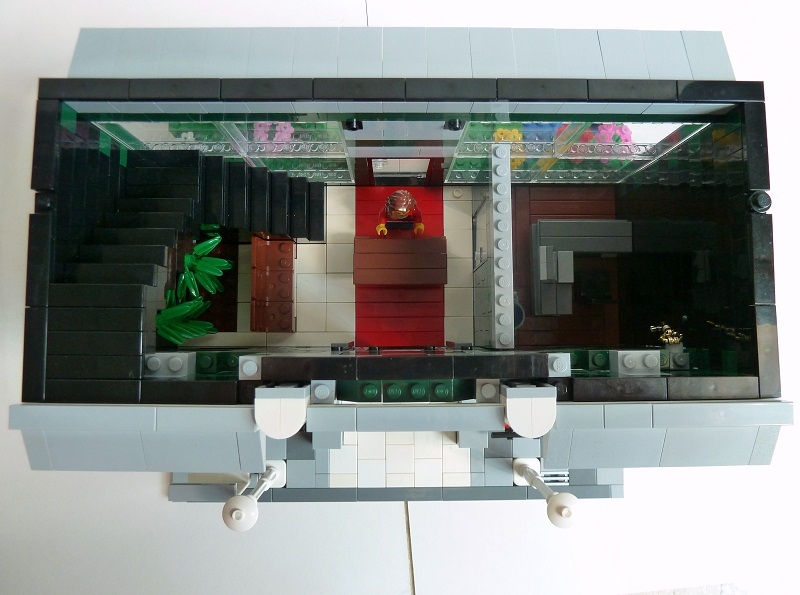 The lack of bricks also explains the used of trans clear panels for the 1st floor, although the concept of opening up the reception area to the garden view wouldn’t be too bad in real life I think? That’s all, hope you enjoyed the little tour! 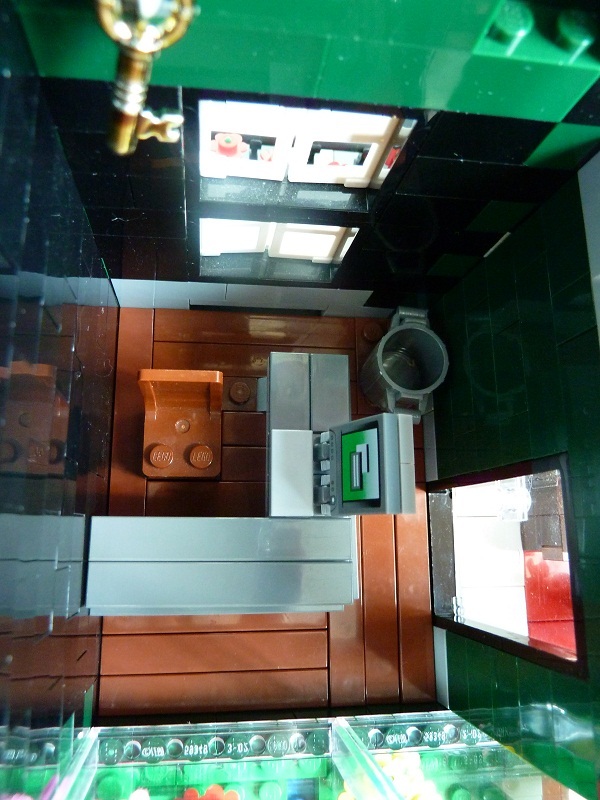 – See my modular corner cinema (also from 10184) pics here. 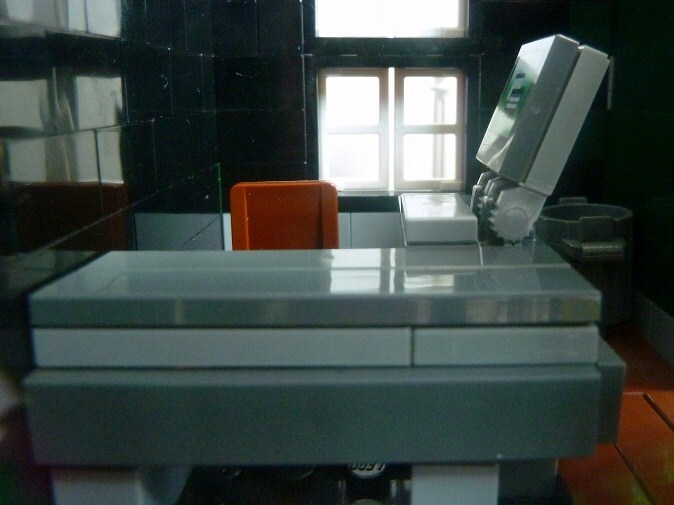 very nice moc, good work! Very lovely and nicely done indeed! Lovely and creative! 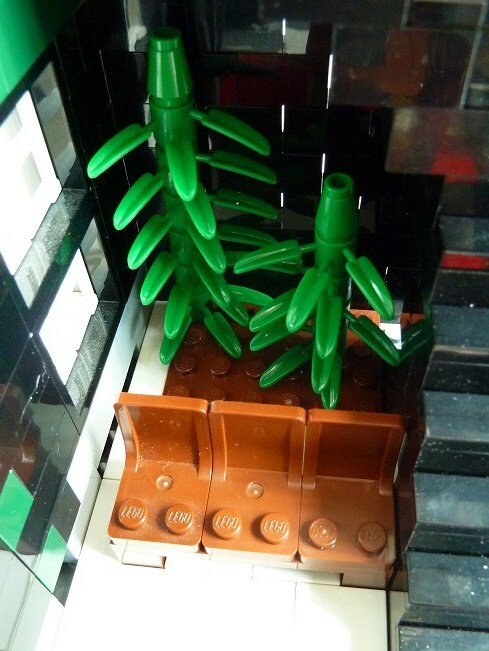 MOC with a storyline. 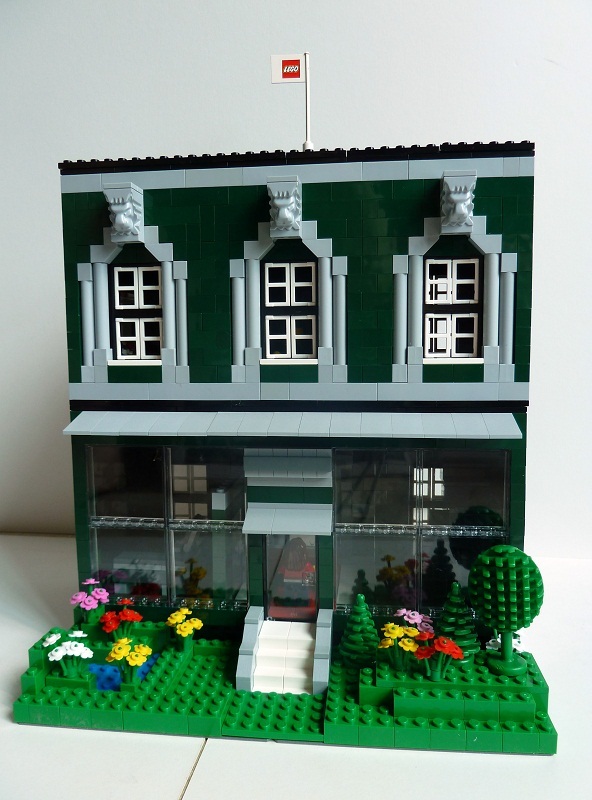 Wonder where you got the extra pieces to MOC this building – is it from Town Plan set? – Thanks for the nice comments! – Huh, better not post. 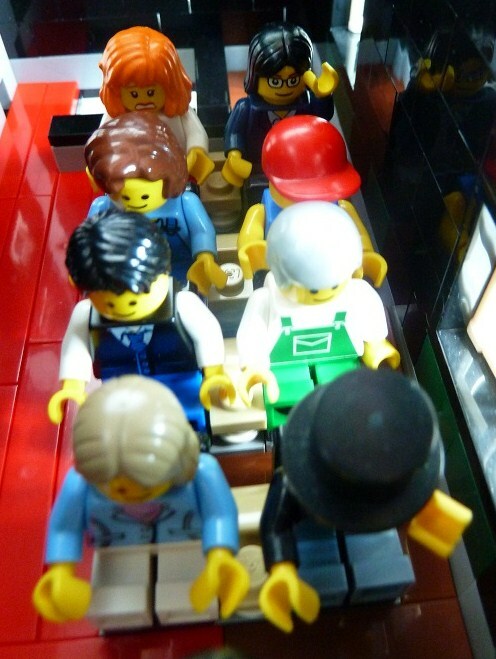 Wait people not happy that I blog about my haul… and they mis-interpret as gloating etc. U shd read the posts on local forums… while I’m happy abt my haul I’m conscious that loads of ppl are unhappy abt what happened. But then no pain no gain? I know the AFOL who got the only Imperial Flagship was there overnight… (and I’m very happy for him that he got the set he really wanted). The rest in the 1st 50 in the q mostly took leave/skip school just to make the sale. So I think those who strolled in at 1-2 pm shouldn’t expect too much… it’s a sale, haven’t they been to one? Even Zara sale also have ppl waiting outside the store before it opens. Arghh… totally off-topic. So yeah, enough on it. 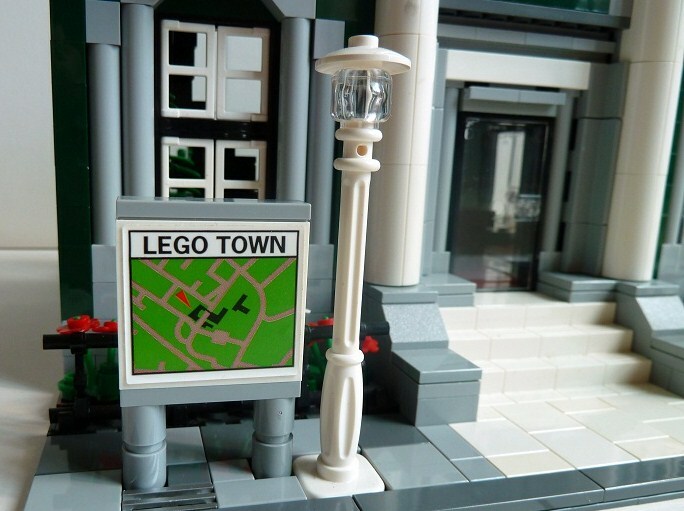 Hi,May i know where u bought your Lego Town Plan frm? 2 sets from when it was widely available in Singapore back in 2008? 1 used set from a former AFOL who wanted to ‘retire’. Haven’t seen any shops with the Town Plan since the last set was sold from Simply Toys Plaza Sing. 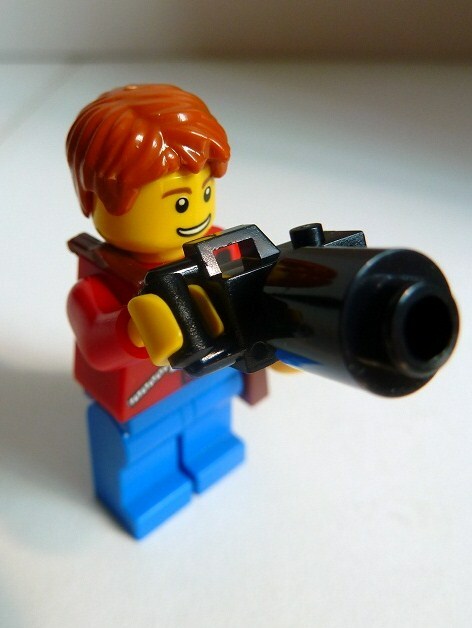 Hi,May i know where u bought your Lego Toan Plan frm? may i know what is SC? Gosh… let me bang my head against the wall again for not buying it at S$150. wow $150 ??? still have this price?? Of course not. Saw at a clearance sale in 2008. Price started at 260 when first arrived in sg I think, then dropped to 200. Another afol once told me not to collect discontinued sets cos too expensive. Looking at town plan and the discontinued modulars, I have to agree. btw the guy i bought from should have 1 more set on ebay but i think he jack up the prices maybe can nego with him to lower down.